Royalty Settings Inspiration Silver Collection Lace Plastic Plates is the perfect elegant disposable plastic plastic and disposable plastic cutlery collection for your next occasion. Made up of the highest quality thick plastic material, this silver reusable plastic plates and silver reusable plastic cutlery party pack for 120 persons is everything you need for your next dinner party or wedding event. The Inspiration Silver Collection Silver Lace Plastic Plates is made up of amazing quality at an even more amazing price. The modern, exquisite and intricate style of these plastic reusable plates will catch your guests attention! These plastic disposable plates and reusable cutlery look like the real deal without the pain of doing dishes! These durable plastic plates and durable plastic cutlery has everything you need to be prepared for entertaining guests. The perfect plastic plates for wedding occasions. Dazzle every occasion with ease while creating a chic and stylish tablescape with the Inspiration collection Silver Party Package. Each Package includes a set of 120 unique and elegant heavy duty plastic plates and matching heavy duty plastic cutlery. This plastic ware party package includes: (120) 10.25" Lace Plastic Dinner Plates (120) 7.5" Lace Plastic Salad Plates (240) Silver Plastic Dinner Forks (120) Silver Plastic Knives (120) Silver Plastic Spoons and (60) Silver Plastic Tea Spoons. Have the whole family over for Thanksgiving dinner or plan your next wedding or big event and let us take care of the silverware. With style and quality you will be sure to be glad you went to Royalty Setting for your plastic cutlery. 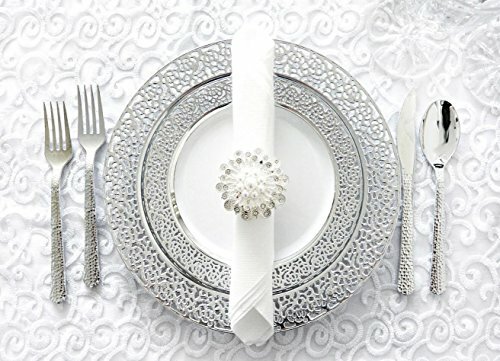 Never do dishes again with these elegant, unique and sturdy silver like plastic plates and plastic cutlery set. If you have any questions about this product by Royalty Settings, contact us by completing and submitting the form below. If you are looking for a specif part number, please include it with your message. Winco VCS-2436 4-Tier Wire Shelving Set, Chrome Plated, 24" X 36" X 72"